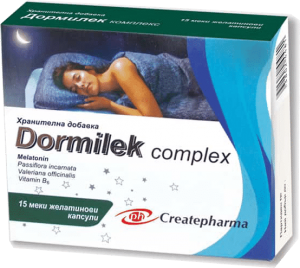 Dormilek Complex | Createpharma Ltd.
Dormilek complex makes falling asleep easier and improves sleep quality! Dormilek complex is the latest development of the company Createpharma Ltd. This product combines well known ingredients for a complete formulation which is the solution for problems with sleep and irregular awakening during the night. It also reduces anxiety and tension caused by everyday stress. Dormilek complex is a nutritional supplement based on Valerian, Passionflower, Melatonin and Vitamin B6 (pyridoxine hydrochloride). Thanks to this special combination, Dormilek complex supports the natural night’s rest, for a person to sleep better and wake up refreshed on the next day. Natural herbal ingredients of valerian and passionflower have a relaxing and calming effect before bedtime. Melatonin is a substance which is produced by the human body, maintaining the natural levels of melatonin in the body and helps to maintain a good day-night rhythm. Vitamin B6 is needed for proper brain function and helps the body in the production of melatonin. Valerian is derived from the roots of Valeriana Officinalis, a plant that grows wild throughout Europe and is widespread as a sedative and calming agent. Therefore, valerian is used in situations of stress associated with the conditions of agitation, insomnia, sleep disturbances, anxiety and other conditions such as nervous tension, panic attacks, palpitations, headaches. Passionflower is extracted from the aerial parts, fresh or dried, of Passiflora incarnata, herb native to South America, which is also found in Europe. Passionflower is well known and widely used for its soothing properties on the nervous system, mainly due to the effect of the flavonoids- diverse array of plant compounds responsible for the effects of the herb. Traditionally, passion flower is used for anxiety disorders and neural and therefore is useful in cases of anxiety and nervous tension, as a result of stress. Melatonin is produced by the pineal gland at night, it is a chemical mediator that regulates as “clock” the cycle of sleep – waking up and improves sleep quality. Thanks to its regulatory activity recovers interference from the time difference, it is useful for people who are subject to frequent changes in time zones. Melatonin is also a powerful antioxidant and studies show that it also slows aging. It has a beneficial effect on the nervous system. It is necessary for the proper functioning of the brain as well as for the production of hormones serotonin and norepinephrine. The vitamin also helps the body in the production of melatonin and acts with synergy with the other ingredients of Dormilek complex. Helps in cases of difficulty falling asleep! Improves the quality and duration of sleep! Has a strong antioxidant effect! Supports the immune system, strengthening the body’s natural defenses! It calms the nervous system! Removes tension and contributes to the onset of sleep! Helps sleep and reduces anxiety! There is a mild sedative! Treats symptoms of irritation and anxiety! Improves the function of the nervous system and liver! It works in conjunction and reinforces the effect of the other ingredients of the combination! Take one ( 1 ) capsules thirty ( 30 ) minutes before bed time. Do not use in young people under the age of 19 , because there is not enough data on use in this age group. Do not use during pregnancy or the breast-feeding period. Do not use in case of allergy or sensitivity to any of the ingredients. Do not operate motor vehicles or machinery for 5 hours after taking this product. 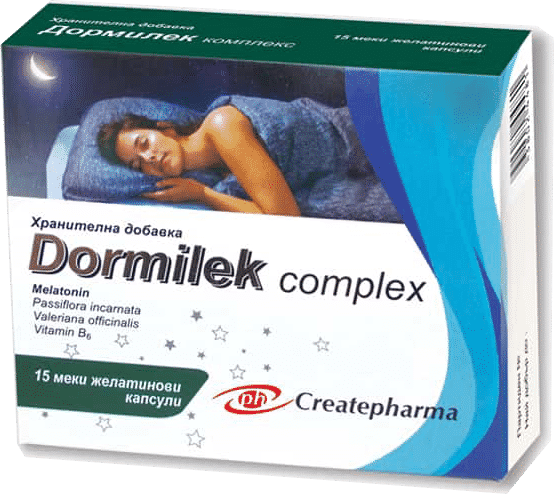 Dormilek complex – Your natural solution to better sleep quality and duration! Helps falling asleep quicker and easier! Helps treating the everyday stress and anxiety, so that you wake up refreshed in the morning! Helps with jetlag and suitable for people working on shifts! This is NOT a sleep drug and you can not become addicted!